The unexpected federal holiday may last even longer in D.C. than other Northeastern cities as local electricity provider Pepco has been known to move slowly while restoring power after past storms. Washington, D.C. and the city’s environs began to slowly shut down on Sunday night, just as the first bands of hurricane Sandy arrived in the form of light rain – but not before a weekend bout of panic buying for storm supplies. Washington DC residents prep for days of expected power outages as buses and subways are shut down. Photo by Elvert Barnes. The federal government said all its offices will remain closed on Monday. The city’s mayor, Vincent Gray, declared a state of emergency as well as a government shutdown. Public schools in Washington, D.C., and neighbouring suburbs of Virginia and Maryland, are to remain closed at least through Monday. Universities cancelled classes. 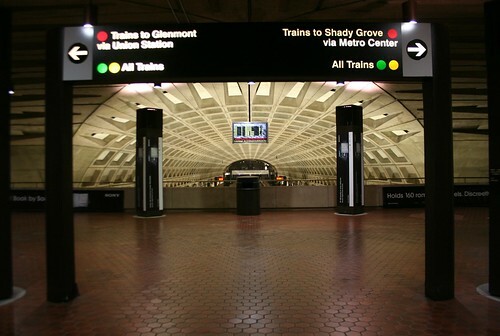 Metro trains and buses, as well as commuter rail and Greyhound bus services were due to stop at midnight. Banks and shops put up signs saying they would be closed. A few diehard establishments in the city centre said they would remain open. “We’ll probably stay open for people who are stuck in the hotels around here,” said a manager at Old Ebbitt Grill, the historic oyster bar near the White House. Other city standards were wavering. “We’re here ’til midnight then we’ll see,” the staff at Ben’s Chili Bowl said. By about 6pm on Sunday night, there was almost no movement on residential streets. Sandy is forecast to dump between four and seven inches of rain on Washington and the surrounding areas, and is expected to trigger storm surges along the Potomac and flooding in some areas. But arguably the biggest concern for a region which regularly suffers power outages lasting several days in severe storms was the forecast for high winds of 40mph with hurricane-strength gusts of 75mph, and the threat they could bring down trees and power lines. It took the local electricity provider Pepco more than a week to fully restore power after a freak storm in June. The provider put out a call to other power companies for 2,500 additional workers, and had crews out on the street in bright yellow vests checking electricity lines at the weekend. But a lot of the utility company’s customers remained nervous. There was a run on flashlights, batteries, bottled water and other storm essentials in many neighbourhoods and some attacks on Pepco’s readiness. Many supermarkets ran out of bottled water and flashlights by Saturday afternoon. By Sunday morning, there were runs on potato chips, and there were occasional accounts of tussles in the aisles over beer and pasta. On the other side of town, at the Fresh & Green supermarket in Spring Valley, shoppers were emptying the magazine racks by the checkout and resorting to energy drinks, seltzer water and alcohol when the still water ran out. “I had one guy in here today: he spent over $700 and all of it was wine except for maybe a few bits of real food he bought to wash it down with,” said Jim Marsh, the bookkeeper.